Slept like logs last night with only one interruption from Kouta wanting to get out at 3am in the morning thinking that there is something more interesting than sleep out side the tent! Otherwise this morning we woke a little stiff but once we started moving about we loosened up pretty quickly. Picked up food supplies from the IGA at Cobden as wasn't sure how big Timboon was or if it had a supermarket and since we were going to Peterborough and we know they definitely don't have a supermarket only a milk bar and pub! so we picked up 2 days worth of food as we will stay an extra day at Peterborough. at this intersection we had a quick break and I noticed just how green the area is considering it is the end of January normally this area would be brown and the dams empty! As you can see from the photo above it is really green. 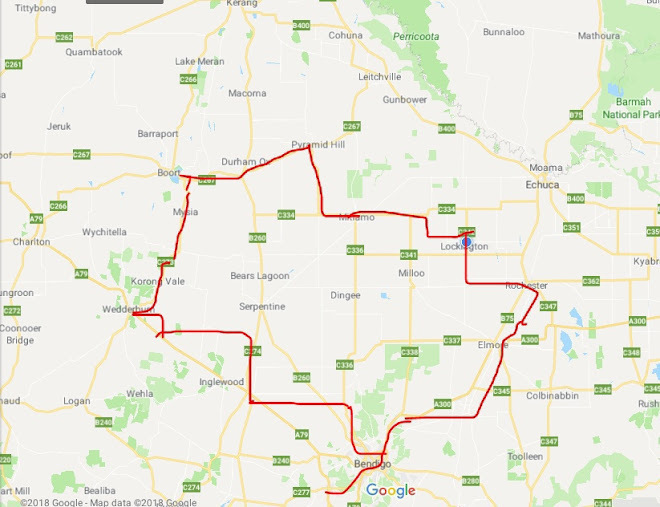 It was an okay ride from Cobden to Timboon and the legs coped okay with the hills so maybe we haven't lost too much of our fitness from last years tour! 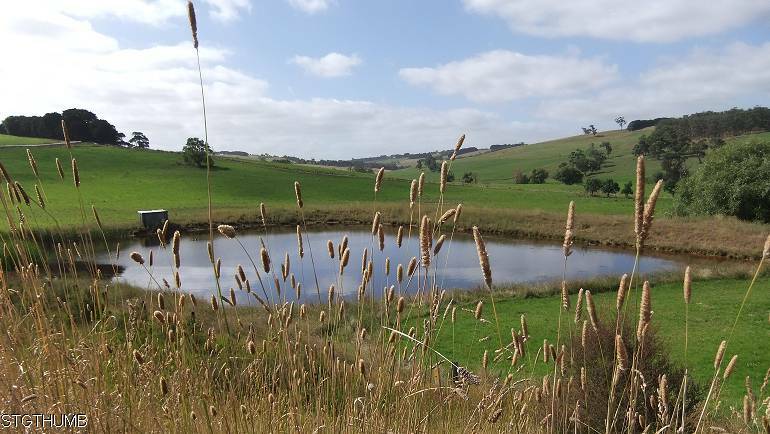 The town of Timboon is bigger than what we thought - as the sign above says it is the first country town in Victoria to adopt a no plastic bag policy. The town has a pretty good IGA supermarket (so we didn't have to get supplies at Cobden! ), a bank, pharmacy, butcher and hardware store. The one thing it doesn't have is a caravan park, but where we took our break there was a sign saying there a proposal for a caravan park. 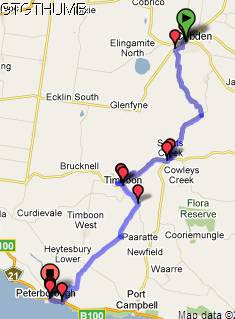 From Timboon there is a nice gradual climb out for around 4km and at the turnoff at Cowleys creek the road levels out a bit and then an ever so slight down hill to the coast with the odd bump here and there. The road is relatively quiet and used mainly by locals as it is only 1 & 1/2 cars wide up to Paaratte and from there it becomes 2 lanes. This road joins up with the Great Ocean Road 2 km before Peterborough. the photo below was taken on the bridge just before you get to Peterborough - it is at the mouth of the Curdies river with the ocean. The campground is on the left and backs onto the inlet so there is calm water although the water is very brown coming down the curdies river - we are assuming it is from the tannin (spelling?) from the flooded rivers. The campground is a top tourist and we are still in peak season so we paid (with our 10% discount) $30.60 for an unpowered site. The unpowered section is tucked away at the back and there are not too many here the first site they put us on someone was already on it so Neil went back and then they put us on site #9 which is in the corner and great for us with Kouta. there are quite a few permanent holiday makers in this park. In fact the whole town is made up of holiday homes as you don't seem to see anyone in the actual houses! It has great facilities - full kitchen and bbqs, damn hot showers and the sites are all well defined! Went for a walk to the look out which is in town and only around 200m from the campground (couldn't go along the beach as dogs are not allowed on the beach during this time until easter during 9am to 6pm). 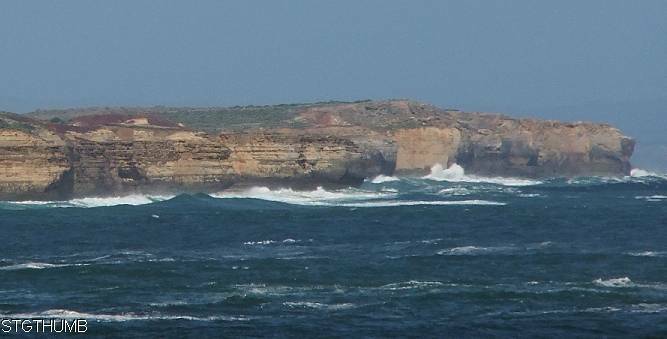 Great views from the lookout especially looking east wards along the rugged coast line. below the lookout is an out crop of rocks and I reckon the one on the left has the best campsite which is currently being taken up by a Shag! 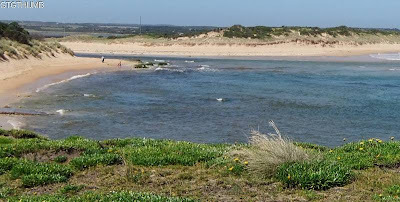 and below looks back towards inland at the inlet where the Curdies river meets the ocean. 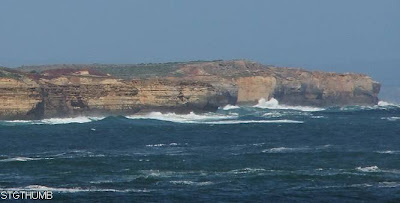 Having a rest day here tomorrow and will go on the other side of the inlet to see if we can let Kouta run there as there doesn't seem to be any one around on that side. I did forget to mention last night when I wrote the blog that as I was cycling along thinking about my blackberries and thinking what I am going to put them in when I pick them and I thought now what did I put them in last year? that's right my collapsible bowls .... OMG I didn't bring the collapsible bowls! ... what the hell are we going to eat out off!!! I yelled back to Neil telling him I forgot to put the bowls in the bags, in fact I clean forgot all about them! Lucky we have 2 cooking bowls which are now doubling up as our cereal bowls! I might try and look for something in Warrnambool!